BillQuick is a very robust cloud-based business management suite that offers time tracking, project management, and billing capabilities. The software offers an intuitive, user-friendly billing and time tracking solution for small and medium-sized businesses. Designed and intended for service professionals, BillQuick is also a viable option for IT firms, accounting companies, construction and architecture firms, and legal offices among others. Companies can opt to implement BillQuick on the cloud or on premises, providing users with the deployment option that caters to their needs and preferences. 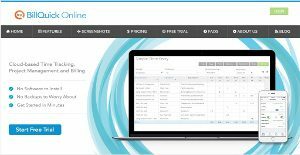 BillQuick presents a slew of project management and time tracking features but its main focus is on accounting and billing, with features that include a collection center, over 100 standard and customizable invoice templates, and the ability to write checks to name a few. BillQuick offers professional services providers with a robust suite of project management features, time tracking capabilities, and accounting and billing tools. The software is branded as intuitive and user-friendly and a viable solution for small businesses to medium enterprises staffed by non-technical individuals. With BillQuick, companies can easily manage their personnel and resources in real time via color-coded task designations and calendars. The software also offers users the ability to attach documents and images to records. Along with the calendar feature, users can also track employee time and monitor their progress via spreadsheet and stopwatch functionality. Project and progress status can be displayed in the time sheets, which can be automatically populated with project data. Managers and employees enjoy quick and easy access to calendars and time sheets, allowing them to track overtime, sick leave and vacation balances. Accounting and billing is where BillQuick shines. The software provides users with a centralized collection center where critical information such as payment history, customer details, account notes, etc. are stored. The collection center is easily accessible to users, which means they have the information they need whenever they need them. Other features include 100 standard and configurable invoice templates, and the ability to send customers invoices in PDF, Excel or Word format. The software also comes with a Reporting Center where users can generate reports from over 500 templates. They can also create custom reports with their company branding, such as logo, colors, themes, etc. It's important to realize that almost no service in the Accounting Software category is a perfect solution that can match all the requirements of all business types, sizes and industries. It may be a good idea to read a few BillQuick reviews first as certain solutions can dominate exclusively in a really narrow set of applications or be designed with a very specific type of industry in mind. Others may work with an intention of being simple and intuitive and consequently lack advanced elements needed by more experienced users. You can also come across apps that focus on a large group of customers and provide a rich feature base, however that frequently comes at a more expensive price of such a solution. Make sure you're aware of your needs so that you choose a solution that offers exactly the features you search for. How Much Does BillQuick Cost? We realize that when you make a decision to buy Billing and Invoicing Software it’s important not only to see how experts evaluate it in their reviews, but also to find out if the real people and companies that buy it are actually satisfied with the product. That’s why we’ve created our behavior-based Customer Satisfaction Algorithm™ that gathers customer reviews, comments and BillQuick reviews across a wide range of social media sites. The data is then presented in an easy to digest form showing how many people had positive and negative experience with BillQuick. With that information at hand you should be equipped to make an informed buying decision that you won’t regret. A platform that integrates very well. A software that finally works for me! A worthy tool for scheduling. What are BillQuick pricing details? What integrations are available for BillQuick? Pros: I've recommended this platform to a dozen other companies. BillQuick boasts a highly robust system that effeciently leaves for precise tracking. Cons: Their security settings can be confusing at times. I feel a majority of them overwrites other functionality that wouldn't immediately assume would be affected. Pros: Its multi-user functionality is good and security restrictions can be manipulated. It lets employees enter their own time but prevent them from having to disrupting other billing aspects within the program. BillQuick has great integration with Quickbooks by streamlining our billing while allowing us to build reports. Their customer support is excellent! Cons: One issue that I faced had something to do with our BQ codes not being to properly move to Quickbooks after a few software updates. But customer support took action by taking our company file and ensuring a solution for this problem. I've recommended this platform to a dozen other companies. BillQuick boasts a highly robust system that effeciently leaves for precise tracking. A worthy software for billing. My company is currently using this platform for time tracking each project. I love how simple and easy it is for tracking time. I've been using BillQuick to compare the actual time used intended for our set budget. Shaved off a lot of time for my accounting team! I found their fee schedules and assignments to be most helpful. It's very time sensitive. I like the fact that there are client contact options available. If you need more information about BillQuick or you simply have a question let us know what you need and we’ll forward your request directly to the vendor.